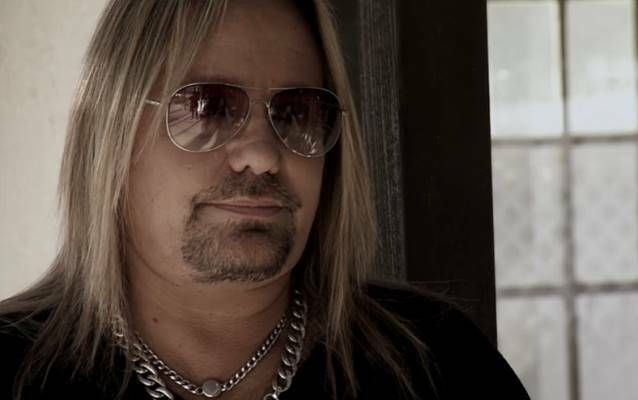 MÖTLEY CRÜE singer Vince Neil was featured in last week's episode of LMN's (Lifetime Movie Network) original series "The Haunting Of". The series follows world-renowned psychic-medium Kim Russo as she shares the experiences of celebrities who have had their lives changed by paranormal events. You can now watch the entire episode of "The Haunting Of" featuring Neil at MyLifetime.com. Each episode of "The Haunting Of" features celebrities' real-life encounters with the paranormal as they return to the site of their experience. During these gripping journeys, Kim unlocks the secrets that haunted each celebrity and attempts to explain the unexplained. Kim also unveils shocking psychic moments and surprising personal revelations as she connects with their loved ones who have crossed over. In last week's episode, Kim met with Neil and returned to the home where he last came in contact with the spirit of his 4-year-old daughter. The journey became an emotional roller coaster as Kim "discovered Vince was being followed by a dark energy that has been causing devastating consequences in his life," according to a press release. "The Haunting Of" is produced for LMN by Jarrett Creative. Executive producers for Jarrett Creative are Seth Jarrett and Julie Insogna Jarrett. Executive producers for LMN are Laura Fleury and Laurie Sharpe. Neil previously appeared on the Travel Channel's "Ghost Adventures" in 2012, when he was filmed throwing a party in the penthouse suite of the Riviera Hotel in the hopes of conjuring up the Ghost of Vegas Past. "After what we experienced, I now really believe in this paranormal phenomena," Neil told Robin Leach of the Las Vegas Sun. "We experienced unexplained, first-hand encounters, including scratch marks on one woman's back, cold sensations, voices and knocking," he continued. "But when we went into Room 908, we really had the shocking, overwhelming physical experience of our lives."